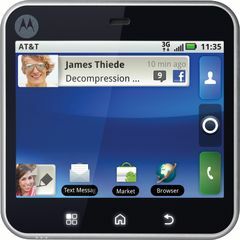 Motorola Flipout MB511 is currently not available in any stores. Watch your favourite video songs and movies in video player. It supports MPEG4, H.264, WMV file types. We had a great time reviewing the Motorola Flipout, we really did. Almost all apps have been spiked with social networking and the music player alone is good enough reason to consider ditching your dedicated MP3 player. Can a lower price tag flip this phone up the popularity charts?